What Is Pet Physical Therapy? Physical therapy involves the use of therapeutic exercises to help your pet recover from acute and chronic health conditions. Physical therapy can reduce pain and improve joint range of motion. Physical therapy can include hydrotherapy, massage therapy, cold/heat therapy, therapeutic ultrasound and electrical stimulation therapy. Physical therapy for your pets includes the use of therapeutic exercises such as using a treadmill, combined with additional treatments, like chiropractic care, to improve your pets recovery from acute or chronic health conditions. Physical therapy may be recommended for your pet if recovering from fractures, orthopedic surgery (including cranial cruciate ligament repair, total hip replacement or spinal surgery) or neurologic events (such as spinal injury). Why might your pet need physical therapy? Physical therapy can help restore, maintain and promote proper functioning and mobility for your pet. It can also enhance recovery after surgery, reduce pain, increase circulation, and improve coordination and range of motion. Additionally, it can help keep your older pets more comfortable and provide another option for those who have not had success with other treatments. Pets of all ages, sizes and breeds can benefit from physicaltherapy. 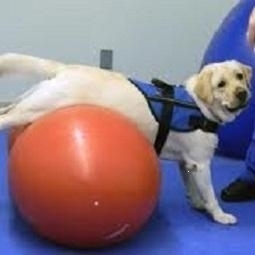 Physical therapy can help improve the quality of life for many animals suffering from chronic pain, osteoarthritis, obesity or muscle weakness. Call today to inquire if your pet is a candidate for physical therapy!